You’ve probably heard it on a reality show or seen it in a text. Thanks to two ambitious young activists, however, this common abbreviation is becoming associated with a far more substantial meaning. One More Generation (OMG) is a nonprofit 501(c)(3) organization dedicated to the preservation of endangered species. While this might not sound very spectacular at first, it becomes far more interesting when you learn that the co-founders are siblings- and both are under the age of 10. 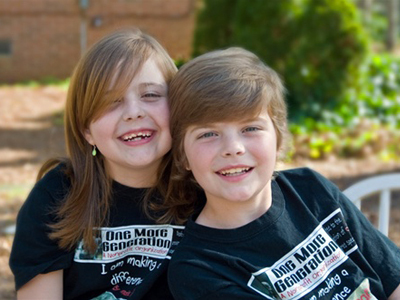 Carter, 9, and his sister Olivia, 7, are students at Fayette Montessori School in Georgia, and are both extremely passionate about animals and conservation. The youngsters have been adopting cheetahs in South Africa for several years. But when they found out that cheetahs, along with 1,000 other species were currently listed as Endangered or Threatened by the government, the duo decided to come up with their own way to help protect these dwindling populations. What have the OMG kids been up to? Since OMG officially became a non-profit in 2009, the young founders were able to meet with their Congressman Lynn Westmoreland and scheduled a future meeting with the Congressman’s Deputy District Director Andy Bush. During that discussion, they hope to share their concerns about HR14 ocean acidification, climate change, and supporting Bernie Sander’s 10 Million Solar Roofs and 10 Million Gallons of Solar Water Heating Act of 2010. Check out the OMG video below to learn more about how you can support the next generation of animal activists! Wow! And I thought I was doing good. These kids blow us out of the water! Kudos! Unfortunatley, THIS is where the jobs will be in the future - saving the planet from the destruction that has been caused, green energy, environemental movements - and that is good. It is nice to easy that kids are passionate about this because that is what will be needed for the future. Oh GOD BLESS THESE FANTASTIC LOVING CHILDREN!!!!!!!!! Sony overreacted as usual... They don't care what the video is about, they only care to block non authorized use of their music. I hate them. Imagine what a fine world we would have if ALL children had the kinds of parents and teachers these two children must have!!! Re your comment about wishing the boys had been taken under the umbrella of the World Wildlife Fund. The WWF actually condones hunting and culling. Perhaps the boys wanted to help wild animals without the onus of being associated with a a group that condones hunting. I think they are smart. There are many people, such as myself, who would not contribute to the WWF for that reason, but would wish to help wild animals by supporting an organization such as the boys started, without the stain of hunting/culling. Claire T.: I've seen several articles about those existing organizations taking contributions from Big Agriculture, Big Oil, and so forth. They also have allowed executives from those corporations to have seats on the boards of directors. If those articles are true, then actually need more groups to do the work, without the influence of corporations that are only trying to look "green." But if those articles are inaccurate, then of course, you're right. very heartening to know there are kids out there like these!